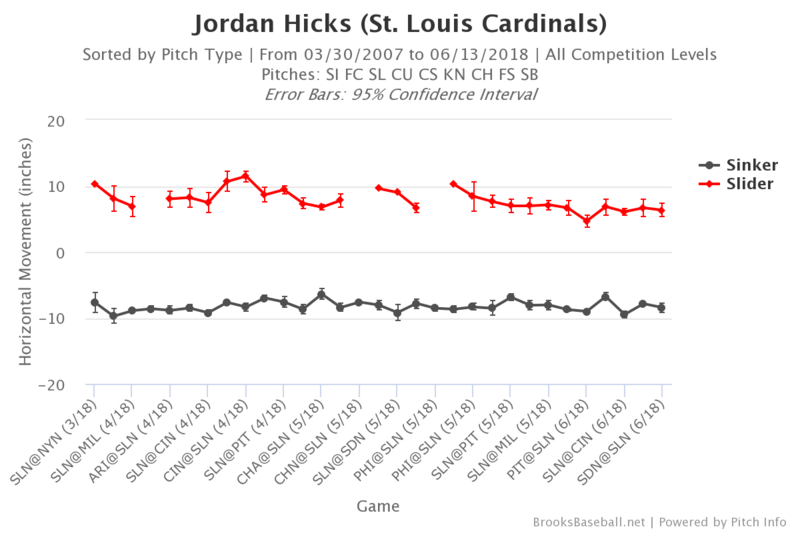 Jordan Hicks once deserved our attention because he was the hardest-throwing pitcher in baseball. He later commanded more of our time because he couldn’t get any strikeouts despite that incredible velocity. Hicks is once again being highlighted at FanGraphs because he has appeared to resolve his previous issues. Over the last three weeks, in fact, he’s been the best reliever in baseball. Hicks is still fascinating because he throws the ball really hard. His 99.7-mph average on his fastball still tops MLB with a healthy lead over Aroldis Chapman, per Baseball Savant. He’s thrown 180 pitches of at least 100 mph with Chapman’s 103 the only pitcher within 125 of him. He’s thrown more fastballs above 102 mph than below 97 mph this season as the graph below shows. Here’s how those numbers compare with Chapman and the rest of baseball. There is a problem for Hicks, however — namely, that two-seam fastballs are not swing-and-miss pitches. Syndergaard gets good results from his two-seam fastball because he throws it for strikes and generates a decent amount of swings and a lot of ground balls. Over the course of his career, though, he has gotten whiffs on the pitch just 8% of the time. Those results are in line with Hicks’ minor-league profile, where he generated a lot of ground balls though did not strike out nearly as many batters as one would think given his fastball. Through 26 MLB fastballs, Hicks has gotten just two swings and misses. Six weeks later, Jeff Sullivan discussed some of the issues Hicks was having in getting strikeouts. Part of this is easy to understand. Why doesn’t Hicks strike more batters out? Just look at the walks. He’s wild. Been better lately, but still wild. Hicks’ overall strike rate ranks in the sixth percentile. Batters are better when they’re not behind in the count. If you don’t have command, you want to at least have control. Since Sullivan wrote that article, here are the MLB leaders in FIP with a minimum of 10 innings. We aren’t dealing with a ton of innings, obviously, but whatever problems Hicks was having, they appear to be solved. As to what exactly was solved involves a few different theories that all likely relate to one another. 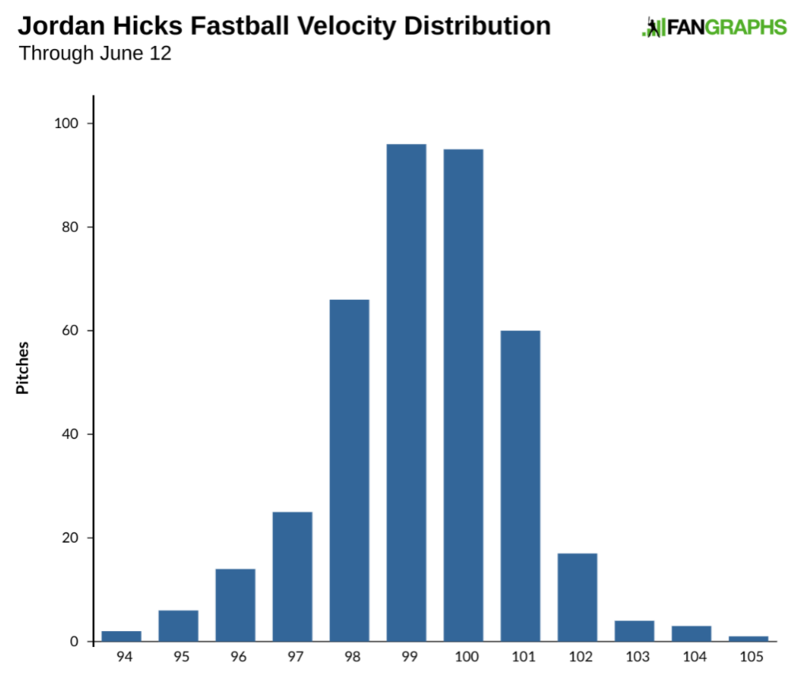 The most noticeable change in terms of results that Hicks has made is with the slider. Joe Schwarz of The Athletic highlighted the differences between the slider of late and the one earlier in the season. Schwarz mentioned velocity, release point, horizontal movement, and spin rate. With another couple weeks of data, it looks like the spin rate isn’t actually that much different in June than what it was in April. The added velocity is certainly a help, though his fastball has gone up a tick, as well. As for the horizontal movement, it isn’t just that it has changed, but that it is much more consistent, as seen in the game graph below from Brooks Baseball. 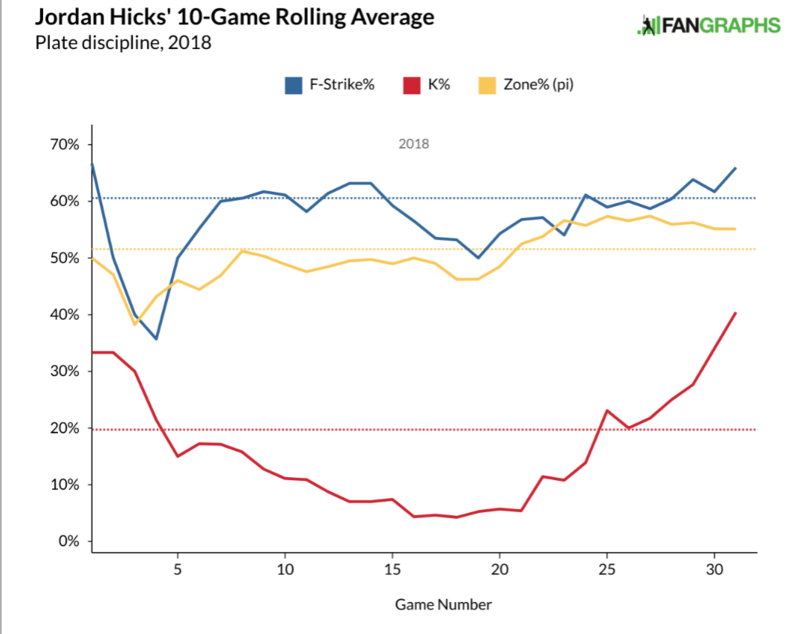 Hicks had a handful of games in April and early May where the vertical movement was close to what it has been during his recent run, but there are games with wildly different results that distort the average in April and May. With the exception of one game, we see a much smoother line of late. Schwarz also mentioned the higher release point, an issue also covered by Patrick Brennan at Beyond the Box Score. Here are the game-by-game release points for Hicks from Brooks Baseball. Hicks’ release point is about three inches higher than it was a few months ago. While the recent numbers aren’t nearly as consistent as the horizontal-movement chart above, there is a little more continuity, particularly with the fastball. Schwarz and Brennan were correct to focus on Hicks’ slider. The pitch is a little bit different than it was earlier in the season, and the more consistent release point and movement has given the pitch better command. However, we should probably turn our attention back to that triple-digit fastball. As good as the slider is, it is only going to be really effective when Hicks gets ahead in the count. This season, when Hicks starts an at-bat with a ball, he ends up walking the batter 26% of the time and getting a strikeout just 16% of the time. When he starts an at-bat with a strike, he ends up with a walk 6% of the time and a strikeout in 28% of plate appearances. The chart below shows Hicks’ first-strike percentage, his percentage of pitches in the strike zone, and his strikeout rate on a rolling 10-game basis. There was a time in the early part of the season when Hicks was getting a decent amount of first-pitch strikes, but he wasn’t pitching the ball in the strike zone, and his slider wasn’t finishing batters off. Hicks’ strikeout numbers really started to increase as he was able to get strike one and pitch in the strike zone generally. To see how the improvements related to his fastball, let’s look at sinker usage when he needed to throw a strike — i.e. on the first pitch or when he was behind in the count. He’s throwing more first-pitch fastballs in the zone, and he’s doing the same when he’s behind in the count. That’s going to lead to fewer walks and more strikeouts. Note that the pitch is actually getting fewer whiffs in these situations. That’s not a big deal because he just needs the pitches to be strikes so he can later finish hitters off with his slider, which is exactly what he does when he can get ahead in the count. 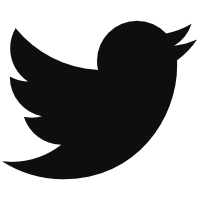 The improvement in the slider is pretty easily seen above in the changes. It is also interesting to see that the slider has been a really good pitch in all situations lately, but it is absolutely devastating when Hicks gets ahead in the count. For that, he can thank his fastball. Hicks has also been lightly mixing in a four-seamer that has some potential, as well. As long as he can command what he’s throwing, the last three weeks aren’t going to be an aberration. Hicks spent the first six weeks of his career above High-A wildly throwing a two-seamer and got good results with a ton of ground balls. He’s now harnessing his stuff without sacrificing velocity and getting the strikeouts that his stuff deserves. For good measure, he’s yet to allow a homer in 31 appearances. The only other relievers to begin their careers at 21 years of age or younger, per Baseball Reference, and do the same are Huston Street with 34 games in 2005 and Victor Cruz with 32 games back in 1978 for the Blue Jays. 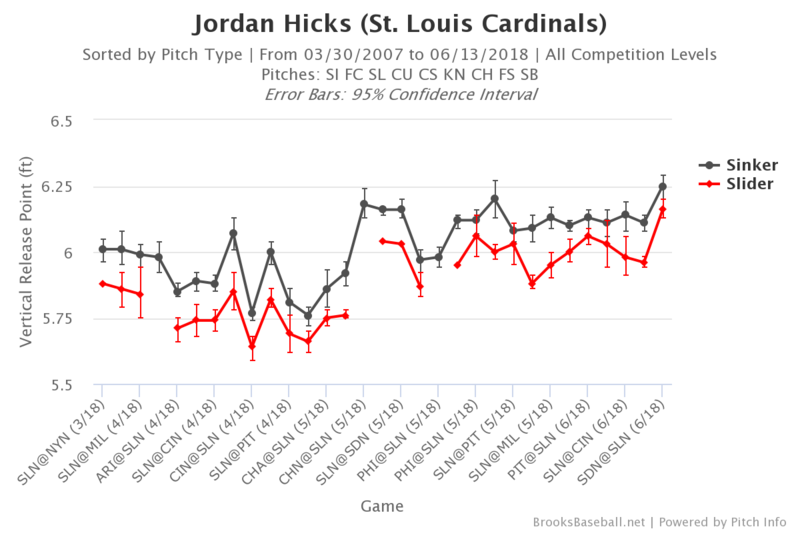 There are definite concerns that his manager will overwork him — he just pitched two innings with an average leverage index of 0.3 on Tuesday — but for the time being, Hicks is the answer to the Cardinals’ late-inning questions as an excellent complement — or successor — to Bud Norris. We hoped you liked reading Jordan Hicks, Now with Command by Craig Edwards! All I could think of when I read this is “yeah, and Trevor Rosenthal and Alex Reyes used to break triple digits too.” Throwing that hard … ain’t good for the body. Tell that to Nolan Ryan,or Bob Gibson. A fastball really isn’t that hard on your arm,breaking pitches are. Also I can’t ever recall Rosenthal hitting 100. I believe Trevor lost the feel for what he was throwing. Rosenthal was at 100 or over the first game he pitched in the majors, versus Milwaukee. I remember watching the gun (at least what was shown on TV) during the game and saying “whoa, this is a fastball.” I also got to watch him in person at Planet Coors when he was definitely hitting 100, although working more at 98-99 most of the time — he finished the game with an epic, 12- or 13-pitch battle with Tulowitzki that included at least one 100-mph heater. (He finally got him to end the game.) Rosie could Bring It. We will see if he ever brings it again. Gibson certainly had a big fastball, but we have no reliable reads on just how big, radar guns not being widely available at the time. I’d guess mid-90s at his peak. As for Ryan … well, we’re talking about “human” pitchers here. Maybe so, but Rosenthal was a hell of a reliever for more than a few years, and it’s not like he is finished as a baseball player. St. Louis will ride with Hicks for his six team-control years and let him go, and it looks like those six years could be super valuable to the team.